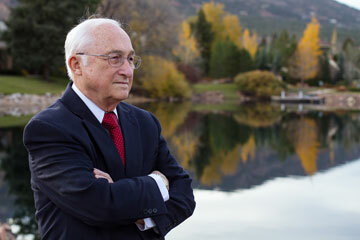 © 2008 John A. Zachman, Zachman International, Inc. 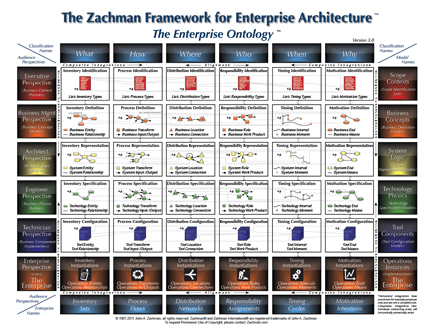 Since the Zachman Framework™ classification was observed empirically in the structure of the descriptive representations (the architecture) of buildings, airplanes and other complex industrial products, there is substantial evidence to establish that the Zachman Framework™ is the fundamental structure for Enterprise Architecture and thereby yields the total set of descriptive representations relevant for describing an Enterprise. The Zachman Framework™ typically is depicted as a bounded 6 x 6 “matrix” with the Communication Interrogatives as Columns and the Reification Transformations as Rows. The Framework classifications are represented by the Cells, that is, the intersection between the Interrogatives and the Transformations. This matrix would necessarily constitute the total set of descriptive representations that are relevant for describing something... anything: in particular an enterprise. More specifically, the Zachman Framework™ is an ontology - a theory of the existence of a structured set of essential components of an object for which explicit expressions is necessary and perhaps even mandatory for creating, operating, and changing the object (the object being an Enterprise, a department, a value chain, a “sliver,” a solution, a project, an airplane, a building, a product, a profession or whatever or whatever). The Zachman Framework™ IS NOT a methodology for creating the implementation (an instantiation) of the object. The Framework IS the ontology for describing the Enterprise. The Framework (ontology) is a STRUCTURE whereas a methodology is a PROCESS. A Structure is NOT a Process. A Structure establishes definition whereas a Process provides Transformation. Conversely, Processes without ontological structures are ad hoc, fixed and dependent on practitioner skills (for example, Alchemy, based on trial and error). Whether you do Architecture or whether you simply build implementations that is, whether you build Primitive Models, the ontological, single-variable intersections between the Interrogatives and the Transformations or whether you simply build ad hoc, multi-variable, composite models made up of components of several Primitive Models. How you do Architecture: top-down, bottom-up, left to right, right to left, where to start, etc., etc. The long-term/short-term trade-off relative to instantiating the expression of the components of the object that is, what is formalized in the short-term for implementation purposes versus what is engineered for long-term reuse. How much flexibility you want for producing composite models (Enterprise implementations) from your Enterprise Architecture (primitive models), that is, how constrained (little flexibility) or unconstrained (much flexibility) you make the horizontal, integrative relationships between the Cell components across the Rows and the vertical, transformational relationships of the Cell components down the Columns. Although these are significant, identifiable, methodological choices, they are not prescriptions of the Framework structure. The Zachman Framework™ is the basis for Architecture - We know what architecture is for industrial products (buildings, airplanes, locomotives, computers, etc., etc.) because in the Industrial Age, it was the industrial products that were increasing in complexity and the industrial products that were changing. If we had not gotten extremely sophisticated relative to architecture for industrial products, we would not likely be able to create and change complex industrial products and we would likely still be in the Industrial Age learning about Product Architecture. Now that we are in the Information Age, it is the Enterprise that is increasing in complexity and the Enterprise that is changing. It is my opinion that Enterprise Architecture is the determinant of survival in the Information Age. Therefore, the Framework for Enterprise Architecture, the Zachman Framework™, has some profound significance in putting definition around Enterprise Architecture, the survival issue of the Century. 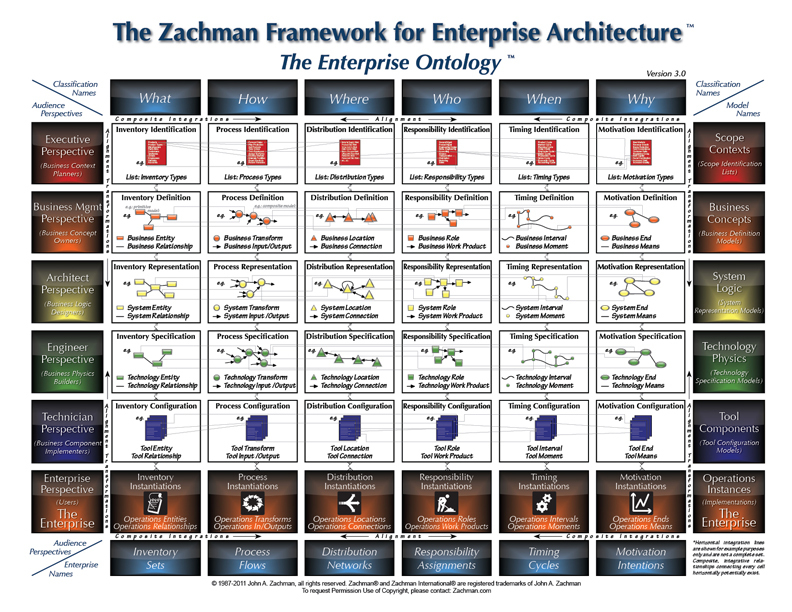 We have yet a LOT to learn about Enterprise Architecture, but I submit, the Zachman Framework™ would be a good place to start. © 2008 John A. Zachman, Founder, Zachman International®, Inc.